Bridal showcases are a great way to look for different vendors, compare pricing, get answers to your burning questions, and even possibly get discounts. 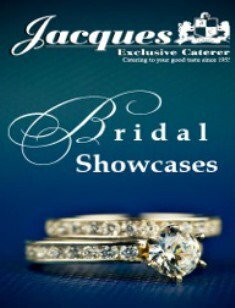 They are a bride’s best friend, and we encourage all of our brides at Jacques Exclusive Caterers to attend at least one bridal showcase. Not all are showcases meant to be informational and help you plan your wedding, they are also meant to be fun. Here are the top fun and informative things you can learn and use for your wedding at a bridal showcase. Raffles are one of the great advantages you get as an attendee of a bridal showcase. Sometimes these raffles are held showcase wide, meaning the host of the showcase will raffle off services, coupons, and sometimes even a honeymoon. Other times, these raffles are smaller and hosted by individual vendors. This means that a baker may be hosting a raffle for a free tier of wedding cake, but not all bakers are required to do so. These raffles are a fun way to get deals, and to learn more about the different vendors present at the showcase. Most showcases will feature a fashion show, this is to keep the attendees up to date on the latest wedding fashions. These are a great way to find your wedding dress, or a potential bridesmaid dress because you are getting to see how the dresses move. That is something a picture will not tell you. Plus these shows are fun to attend, with music, awesome lighting, and a party atmosphere, they are a great aspect of a bridal showcase. Many showcases will feature some type of entertainment. This may be local DJ’s that are for hire, and sometimes even local bands. It is a great way to listen to a couple of different DJ’s or bands to get a feel for who you would want to play your wedding. Maybe you attend and the DJ you were thinking of hiring only plays club music, but you’re interested in more of a variety, now you know that DJ’s style and can change your plans if you need to. Or maybe you have no idea what you want to do for music, so listening to a few different options will help you think about what you want for your big day. As anyone who has attended a wedding will tell you, one of the best and most memorable parts is the food! Because of this, it is so important to be picky when choosing the food and caterer for your wedding. You want your guests to be full and happy, not hungry and disappointed. To help with this decision, take advantage of all the yummy free samples at a bridal showcase. From entrees to cakes, there will be samples of everything you need to make your wedding food a hit! Bridal showcases are a fun way of learning what you do and don’t want for your wedding. Plus, you can often score some awesome deals at them through vendors, so if you are looking to attend a bridal showcase sign up for our Jacques Exclusive Caterers Bridal Showcase. At the Jacques Reception Center in Middletown, NJ on October 29th from 12 PM until 3 PM we will be hosting a showcase with everything you’ll need to start planning your wedding. We look forward to seeing you there!